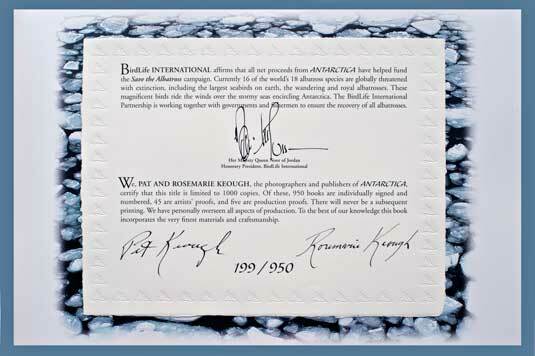 Every copy of ANTARCTICA has been personally autographed by three individuals: Pat and Rosemarie Keough, photographers, authors, and publishers; and also by HM Queen Noor of Jordan, past Honorary President of BirdLife International. 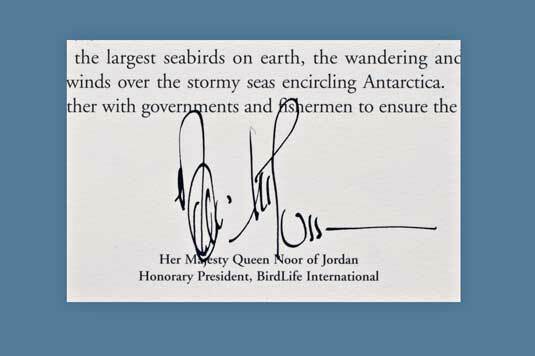 Her Majesty’s signature affirms that ANTARCTICA has benefitted the Save the Albatross campaign. 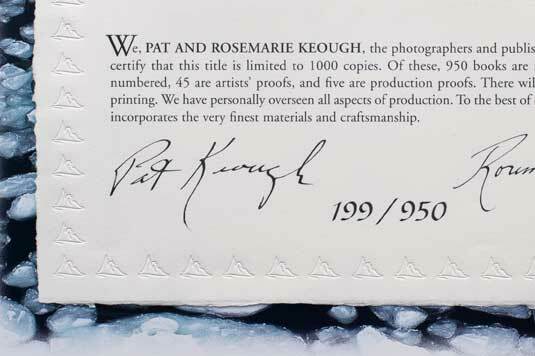 The Keoughs’ autographs certify that ANTARCTICA is forever limited to this single luxurious edition of 950, plus 45 Artist Proofs and five Production Proofs. A very few volumes of ANTARCTICA are even extra special. Four have been autographed and annotated by 31 polar luminaries; and one has been autographed and annotated by 32 polar luminaries. Several years were required to collect signatures from these remarkable explorers, pilots, physicians and scientists. Beneath their autographs, each states their claim to Antarctic fame in their own handwriting. Of these unique volumes, just one remains available — ANTARCTICA #950/950. Click here to download a pdf document with details of signatories. For inquiries email the Keoughs.